Bu-na-na, what's my name? 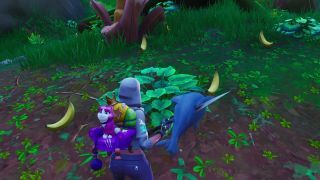 With the recent 8.20 update to Fortnite, a number of new consumable items were added - including Fortnite Bananas, which are in keeping with the tropical theme introduced to the northeast quadrant of the island, as well as the Peely banana skin outfit you can unlock from progress through the Battle Pass. These bananas function in much the same way as the Fortnite Coconuts and Fortnite Peppers in that they give you an immediate 5 health boost, but you won't be able to eat them if your health is already at full capacity. We've searched out all of the Fortnite Banana locations for you, so if you need some potassium for stamina then we have you covered. Unsurprisingly given their tropical nature, you can only find Fortnite Bananas in the jungle biome, concentrated around the Lazy Lagoon and Sunny Steps locations. On the map we've marked all of the areas where we successfully spotted the delicious yellow fruit, which are generally found under banana trees which look like the ones pictured below with their distinctive protrusions around the base. Track down some of these, and you should hopefully be guaranteed to see some Fortnite Bananas nearby.